Known as the Republic of Iceland officially, situated in the North Atlantic Ocean, Iceland is the second largest island in Europe after Great Britain. Early inhabitants of Iceland included the Papar, who were monks of Irish or Scottish descent, who lived there from the 9th century. These Celtic priests likely traveled to Iceland on a mission to promote Christianty throughout the world. Norse settlers, the Vikings, arrived in Iceland around 874 and established a permanent settlement. Ingolfur Arnarson landed in what is now Reykjavik with his wife, and is considered the first Norse settler of Iceland. The island was soon populated by other Norsemen, Irish, and Scottish. These settlers formed the nation as the Icelandic Commonwealth, which persisted through to the 13th century, when Iceland became part of the Kingdom of Norway. With the union of the Scandinavian nations, Norway, Denmark, and Sweden, and later just Denmark and Norway, Iceland became a dependency of each federation. Plagues, disease, and famine afflicted the island over the next centuries, killing much of the population of Iceland and destroying its progress. With the break-up of Norway and Denmark in 1814, Iceland became a dependency of Denmark, but soon began working towards independence. The first gain in the nation's fight was in 1874, which granted Iceland a degree of autonomy. Finally, in 1918 was granted 25 years of sovereignty as the Kingdom of Iceland, but remained united with Denmark, who was responsible for foreign relations for both kingdoms. When this period ended, the people of Iceland voted for independence, and Iceland became a republic. 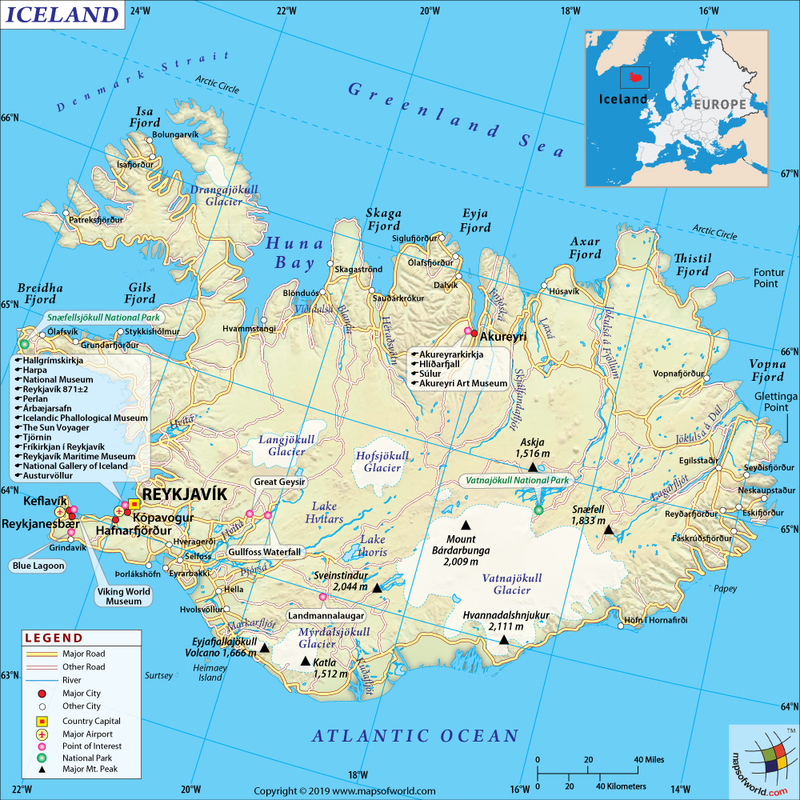 Iceland is an island nation, located within the Atlantic and Arctic Oceans. The nearest nations to Iceland are Greenland, the Danish territory of the Faroe Islands, as well as Norway and Scotland. Iceland lies just outside of the Arctic Circle, and the main island's terrain is mostly covered in tundra, and less than one-quarter of the land sustains vegetation. Much of the interior is cold and mostly uninhabitable. 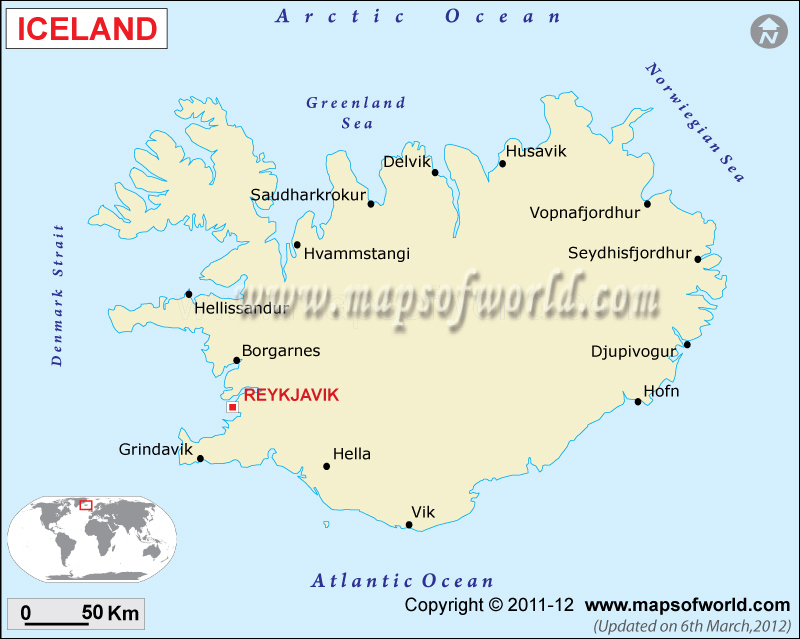 Also included in Iceland's territory are about 30 smaller islands. Along Iceland's almost 5,000 kilometers (3,100 miles) of coastline are deep fjords cut into the landscape. These coastal regions are home to the vast majority of the population of Iceland. Iceland is situated along the Mid-Atlantic Ridge, the point where the Eurasian tectonic plate meets the North American plate. The friction between these plates causes frequent seismic activity, creating active volcanoes and geysers. The main volcanoes of Iceland include Hekla, Eldgja, Eldfell, and the recent major eruptions of Eyjafjallajokull in 2010 and Grimsvotn in 2011 caused major issues with their ash and lava flows. Iceland's national parks are Vatnajokull National Park, Snaefellsjokull National Park, and Thingvellir National Park. These parks are important natural and geological sites of Iceland, with geysers and waterfalls, and Thingvellir was designated a UNESCO World Heritage site. Many visitors to Iceland follow the Golden Circle, a route that loops from the capital in Reykjavik to Thingvellir National Park, and to several other attractions. Stops along the loop usually include visits to Geysir and Strokkur geysers, the crater of Kerio, Hverageroi village and Skalholt church. Another tourist route is the Diamond Circle, which takes place in the north part of the island, and stops in the village of Husavik, Asbyrgi Canyon, Lake Myvatn, and the Dettifoss Waterfall. The latter is known as the most powerful waterfall on the continent. This loop also travels through other natural sites, including waterfalls and lava fields. Dimmuborgir, sometimes called Dark Castles, is a natural site formed by volcanic rocks and caves, creating scenes that resemble ruins of an old castle. Most visitors arrive at Iceland's Keflavik International Airport, about 50 kilometers (30 miles) outside of the capital, Reykjavik. There's another airport in Reykjavik, though it is mainly a domestic airport, with some regional international flights. Cars are the main form of transportation around Iceland, with many paved and unpaved roads. Iceland's Ring Road circles the outer edges of the island, which is where the population lives. There is no train system in Iceland, but there are buses. Ferries are available for transportation between the main island and the smaller islands.